Add Some Steam To Your Game! IN THE AGE OF STEAM, COAL IS KING! 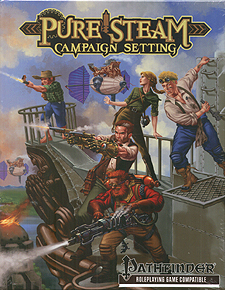 The Pure Steam Campaign Setting is set in the age of steam, and is fully compatible with the Pathfinder Roleplaying Game. The Federated States of Ullera serve as the launching point for endless steampunk adventure.